On Friday, Karl-Ulrich Köhler, chief executive officer of Tata Steel's European operations, said their proposal to cut 900 jobs was part of a strategy to transform the company into an all-weather producer, capable of succeeding in difficult economic conditions. The announcement followed Tata Steel Europe's operating loss of Rs 40 crore (Rs 400 million) in the quarter ending September, against an operating profit of Rs 505 crore (Rs 5.05 billion) a year before. It wasn't the first job cut at Tata Steel Europe, earlier known as Corus. In the past three years, the company has retrenched a little over 3,000 employees, due to the 2008 crash and the 2012 crisis. The acquisition of Corus increased Tata Steel's capacity five times. However, in the past five years, the domestic operations have contributed 50-80 per cent to the profits. In 2007, when Tata Steel acquired Corus, an Anglo-Dutch company, for $12.1 billion (Rs 53,460 crore), India's first Fortune 500 multi-national company was born. The deal made Tata Steel the world's fifth-largest steel producer, with annual capacity of 25 million tonnes. The deal promised access to high-end European markets, supported with low-cost Indian manufacturing. The company was in fact on an acquisition spree for the earlier two years - it had acquired NatSteel in Singapore and a 67 per cent stake in Thailand's Millennium Steel, applying the same logic of shipping low-cost steel slabs to finishing plants abroad. Corus was, however, also bought at a 34 per cent premium to Tata's original bid, as Brazil's CSN got into the race. It was a boom time for the steel industry as well, due to rising demand from China before the 2008 Olympics. In comparison, Lakshmi Mittal's $34-bn (Rs 156,536 crore) acquisition of Arcelor in June 2006 was cheaper, at an Ebitda (earnings before interest, tax, depreciation and amortisation) multiple of 4.3 vis-à-vis one of nine for Tata Steel's acquisition of Corus. Nevertheless, it was considered a "must deal" by many veterans, as the industry was going through consolidation, with leaders such as Lakshmi Mittal looking at this process as the way to bring scale and profitability. Then, the 2008 subprime crisis happened. With the collapse of marquee names such as Bear Stearns and Lehman Brothers, the Western world went into a tailspin. Automobile companies and construction companies, the main sectors affected in the financial crisis, were key customers of Corus. The company recorded a 23 per cent decline in Ebitda for 2008-09, followed by a $303 mn (Rs 1,361 crore) operating loss in 2009-10. This was attributed to a significant decline in European demand and continuation of production at the loss-making Teesside Cast Products unit in the UK. A consortium of four customers pulled out of a 10-year purchase contract with Corus, leading to a loss of nearly 1,500 jobs. The contract had helped the company sell nearly 80 per cent of the plant's total output. "There is nothing new to the cyclical nature of steel business," said Vikas Kaushal, partner at global management consultancy firm A T Kearney. "A company's strategy for scale and footprint should not be undermined with every decline in the cycle." Corus undertook two major cost saving initiatives in the second half of 2008-09. Total savings in 2009-10, with both the programmes, were Rs 6,800 crore (Rs 68 billion). The company came back into the black in the second quarter of 2010-11, on the back of improved economic sentiment and demand for the alloy, as governments in the US and Europe increased spending. The company reported operating profit of Rs 886 crore (Rs 8.86 billion) for the quarter and renamed Corus as Tata Steel Europe. It also agreed to sell the beleaguered Teesside plant to Thailand's Sahaviriya Steel Industries, for Rs 2,242 crore (Rs 22.42 billion). The refinancing of about Rs 24,700 crore (Rs 247 billion) of term loans and revolving credit facilities was also completed. This pushed the repayment by three to four years, besides giving additional flexibility to borrow for working capital purposes and to incur capital expenditure. Following this, the company reported Rs 4,111 crore (Rs 41.11 billion) Ebitda for 2010-11 and Rs 1,775 crore (Rs 17.75 billion) for 2011-12. 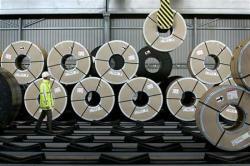 The European debt crisis again proved a drag on Tata Steel's consolidated performance. On a standalone basis, it reported Rs 2,669 crore (Rs 26.69 billion) Ebitda for the quarter ending September, compared with Rs 2,779 crore (Rs 27.79 billion) in the year-earlier period. Sales in India rose 13 per cent to Rs 9,034 crore (Rs 90.34 billion), while sales volume grew five per cent to 1.73 mt. "European steel demand and prices have weakened since the spring and this took its toll on our financial performance," said Köhler while announcing the quarterly result. "Our response has been to accelerate our efforts to reduce those costs that we can influence." Obviously, analysts feel domestic operations will continue to play their role and give back-end support to the overall performance. "We do not anticipate significant improvement in the company's financials in the near term," said Umesh Patel, analyst with Mumbai-based domestic brokerage K R Choksey.